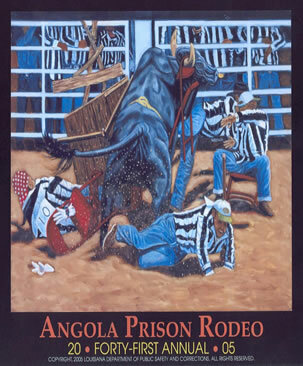 Today a co-worker told me about her trip to Louisiana where she attended a prison rodeo. It sounded like something from another era. Monkeys riding dogs, groups of inmates sitting in the middle of the arena inside hula-hoops seeing who could sit still the longest before a bull gored them. Prisoners were paid $15 and got out of their cell for the day if they participated. One contest paid $500 if they could grab some item that was tied to the head of a full-horned bull. They were getting knocked out left-and-right, then pulled out and taken away in ambulances. I guess those inmates figured if they got hurt, a few weeks or months in the prison hospital would be like a wonderful vacation. At one point someone announced over the loud speaker that a child had lost her parents. Can you imagine losing your kid at a Louisiana prison rodeo?